Choose payroll services that fit your business. 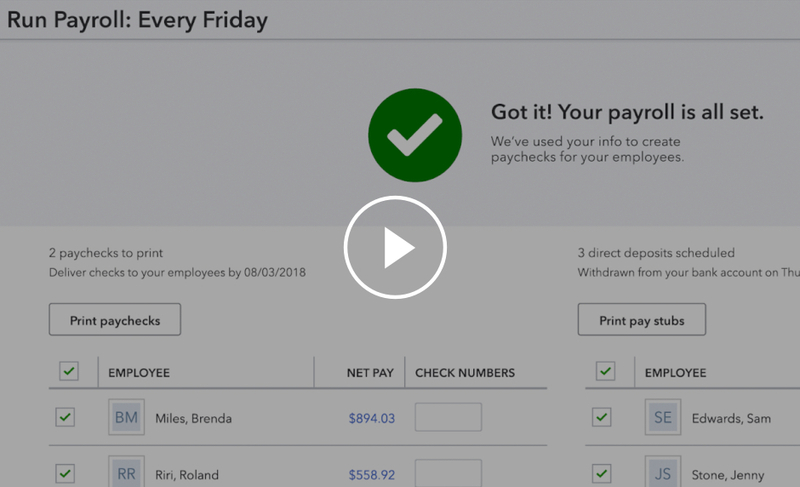 Fast and free Same Day Direct Deposit for employees and contractors lets you submit payroll when you're ready, so you can keep funds a bit longer. We help 1.4 million businesses do payroll and file taxes. We’re ready to tackle yours. Based on overall number of customers for QB payroll products as of 10/2018. Based on an Intuit survey of 505 QuickBooks Payroll customers in Dec 2018. Based on an Intuit survey of 505 QuickBooks Payroll customers conducted in December 2018 that responded with >$0 in savings in the past year. Median time for QuickBooks payroll customers to view and approve payroll is less than 5 minutes. *Based on an Intuit survey of 505 QuickBooks Payroll customers in December 2018 who stated average time savings compared with their prior solution. Based on an Intuit survey of 505 QuickBooks Payroll customers in December 2018. Based on Intuit survey of 1,000 employees conducted in June 2018 and on reported payroll times for monthly subscription products offered by comparable U.S. online payroll providers. Based on an internal analysis of QuickBooks Payroll customers.